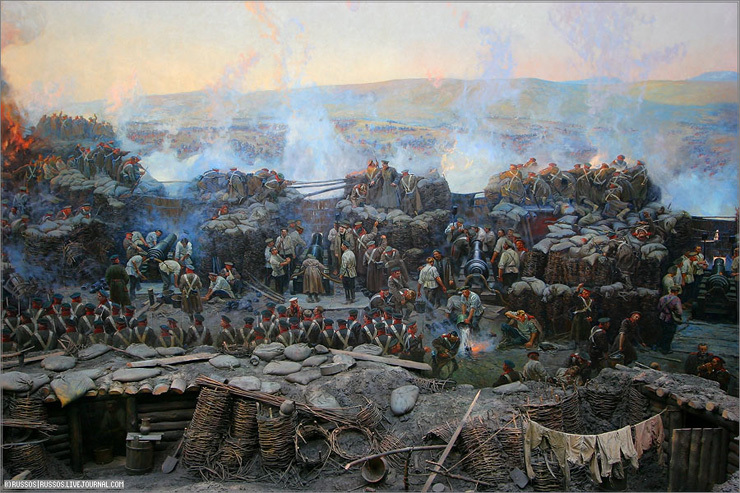 One of the most notable events involving the city is the Siege of Sevastopol (1854-1855) carried out by the British, French, Sardinian, and Turkish troops during the Crimean War, which lasted for 11 months. 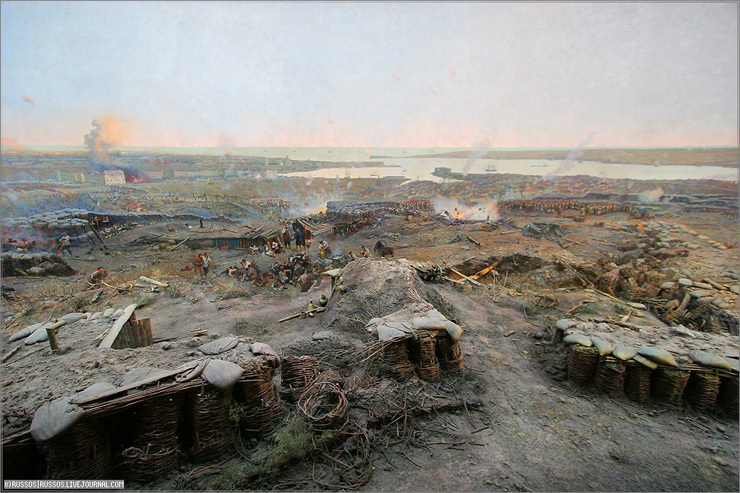 Despite its efforts, the Russian army had to leave its stronghold and evacuate over a pontoon bridge to the north shore of the inlet. 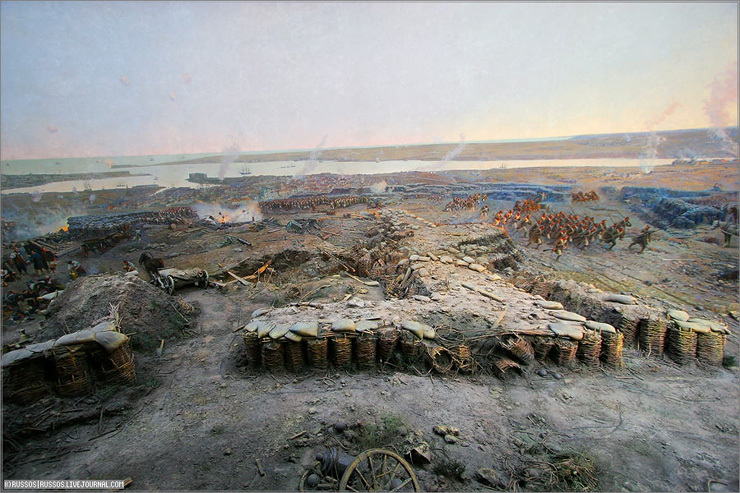 The Russians had to sink their entire fleet to prevent it from falling into the hands of the enemy and at the same time to block the entrance of the Western ships into the inlet. 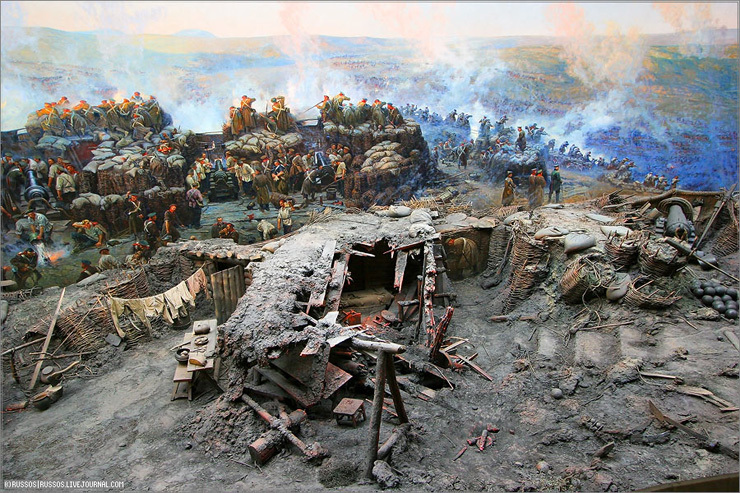 When the enemy troops entered Sevastopol, they were faced with the ruins of a formerly glorious city. 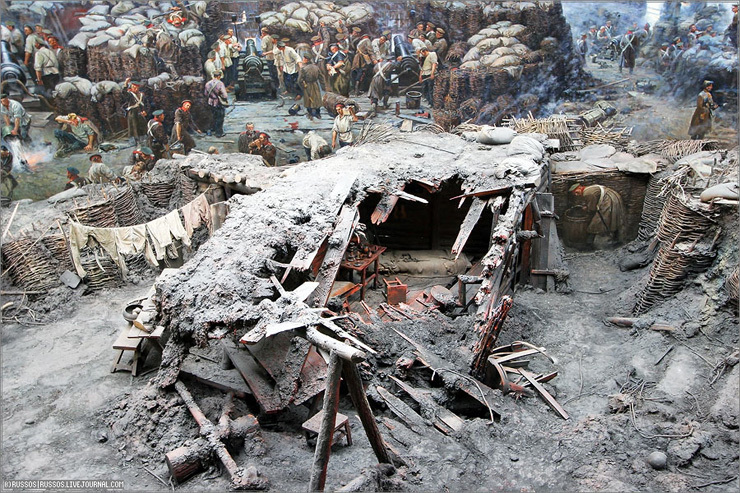 A panorama of the siege created by Franz Roubaud and which was restored after its destruction in 1942 is housed in a specially constructed circular building in the city. 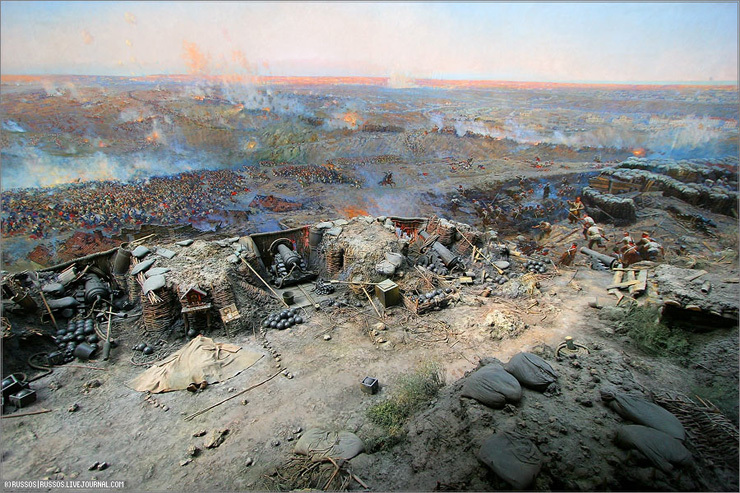 It portrays the situation in the height of the siege, on 18 June 1855. 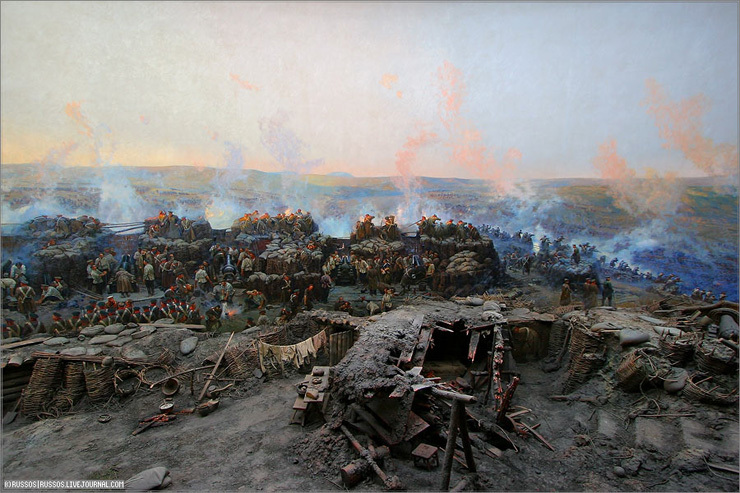 It was made with two methods – the closer to the observer layers are made with the real objects – cannon balls, cannons, grass, fortification logs, guns – everything is real etc and further from the observer starts the epic drawing on the round walls of the panorama, creating the illusion that the observer is standing on the top of the hill in the center of the battle for the defense of Sevastopol. Once again I see you have chosen a course of easy self-amusement. Wouldn’t it be much better if you exercised your imagination and creativity and pretended to be someone who is not a regular, respected poster here? However, if you feel you have not had the adequate training in the art of deception, you may apply for a position and even a scholarship to enter one of our special schools in the countryside of my beloved Persia. There, you will be given the best training in how to be a sneaky liar, instigator, and troublemaker. If you excel, you will receive “graduate training” in a nice place which will test your skills and offer opportunity for quick promotion, such as Lebanon, western Afghanistan, or, if you REALLY do well, in Iraq. Meanwhile, I have an entire country to manage, several more to disrupt, and friends coming over for dinner and I haven’t even started cooking. I really don’t have time to be a personal tutor. But i seriously prefer to “no retreat, no surrender”! ! ! ! ! ! ! ! ! ! ! 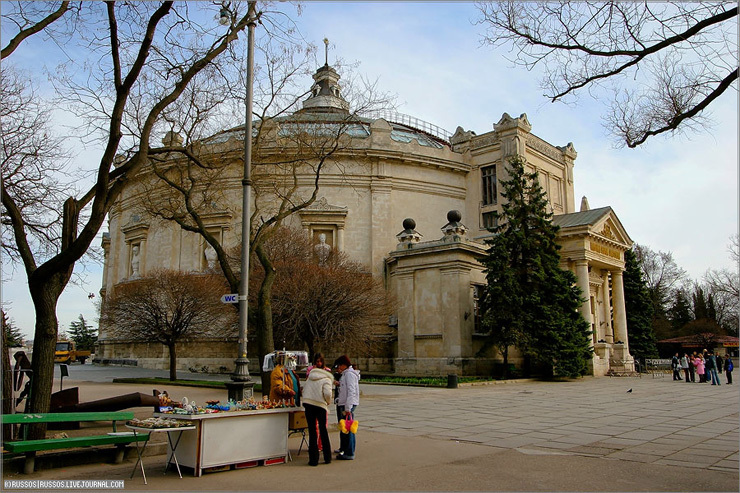 Sevastopol is Russian city forever ! Can i ask something to you?what is the definition of European?i think Russians are also “true” Europeans! ! ! ! ! ! ! ! ! ! ! ! ! ! ! ! ! I still haven’t figured out if they are european or not, it seems to me they have a foot in both european and asian worlds. What about them being Slavic? It really would take an opinion poll of Russian people. My statement about the “europeans” may have been in error but I meant to say that the people who were attacking them were “europeans”. I really don’t know much about the war itself, just the basics. I scoff at ridiculous Russia, and laugh at its inept military. 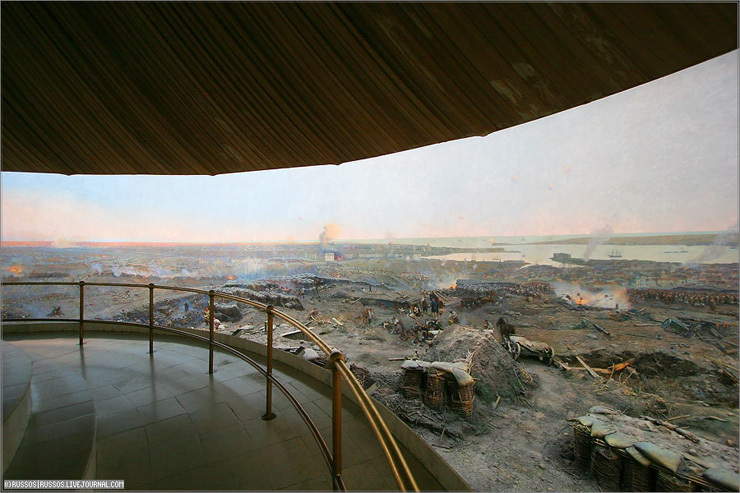 I was in Sevastopol last summer and saw this panorama and it was really amazing. So i can recommend a visit there. The Crimea in general was a really nice place and i will definetly go back there some day. I was in Sebastopol and saw lots of Tatars taking over and it was really amazing. 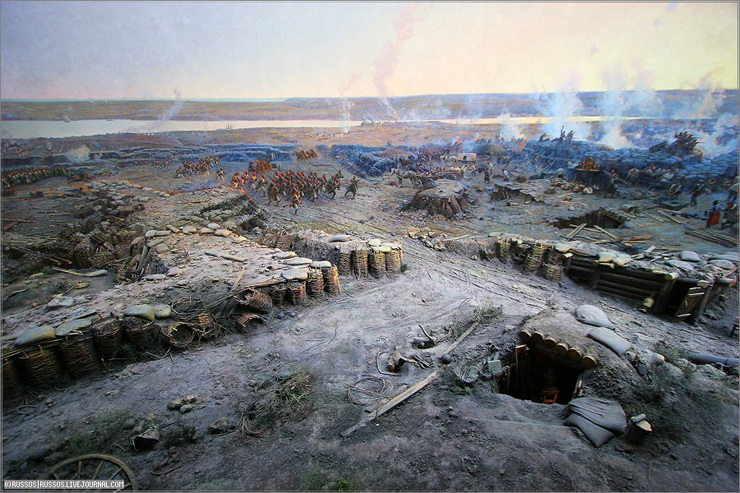 I predict another Crimean War in the not-too-distant future. True piece of art, incredibly detailed stuff. you, sir, are no art critic. Same to you! ! ! ! ! ! ! ! ! Wow, fascinating work. 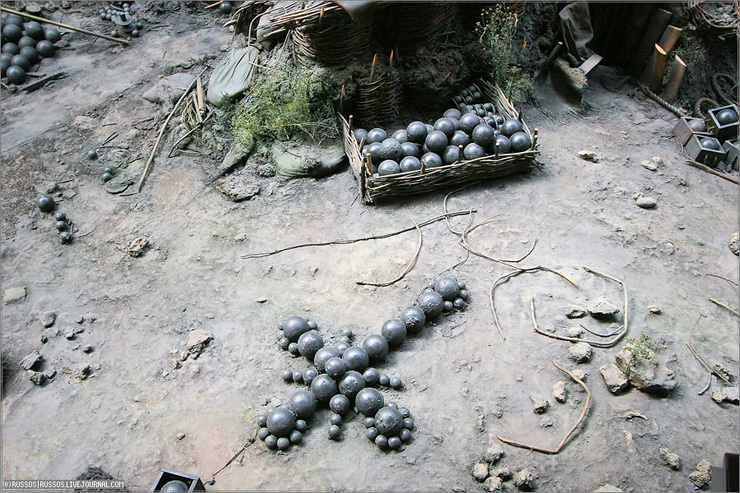 I’m a fan of history and art, this sort of subjectmatter fascinates me. Thanks for sharing with us. Very nice artwork. 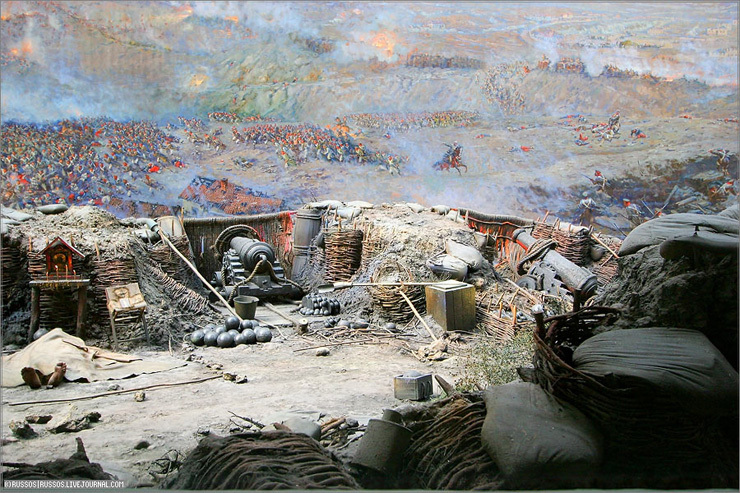 Similar panorama is in Prague, it depicts the medieval battle of Lipany, but it is not as big as this one. 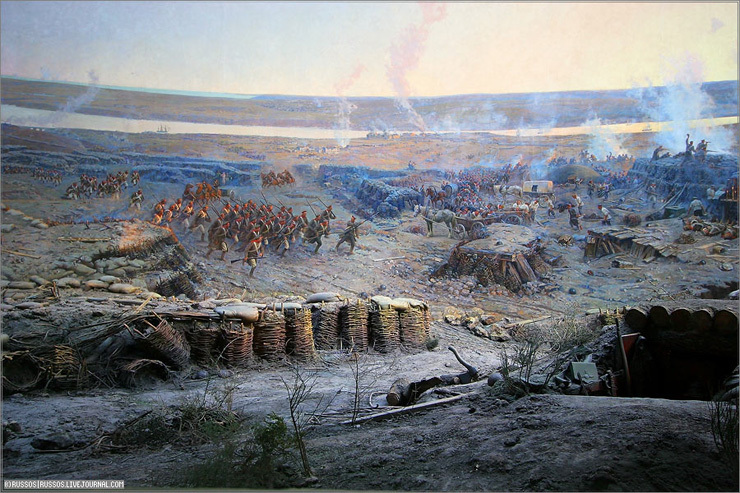 Concerning the Crimean War, it was one of those Russia lost. The war was about who will control the Bospor and Dardanelles. As far as military ineptitude is concerned, it is not specific to Russians. 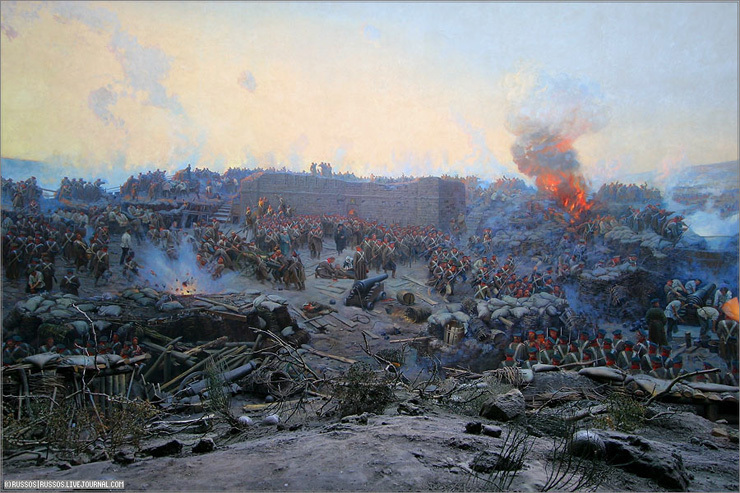 The useless massacre of a whole English light cavalry brigade became legendary and is reflected even in pop-culture (see “The Trooper”, song by Iron Maiden). That’s pretty awesome. 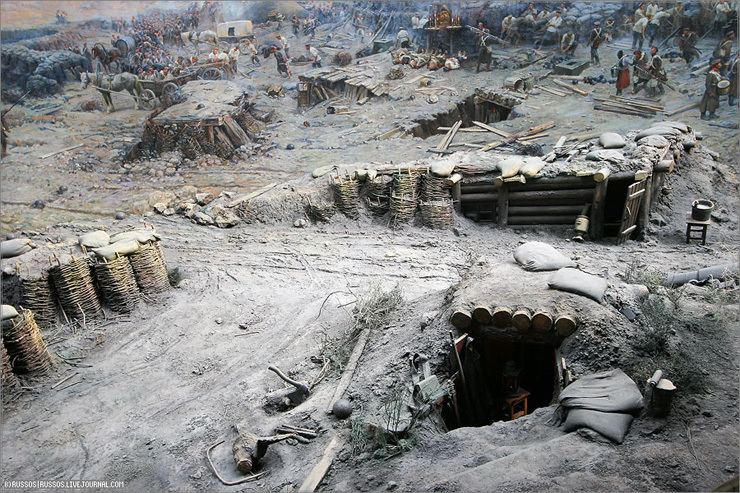 We have one here in Atlanta that depicts the Battle of Atlanta during the American Civil War. BTW, love your website, it’s really cool to see how people in other parts of the world live. o, ya tyt bil. Eto bilo davno,v 2003. Tok vrode eto v Ykraine.